I got a Kensington Virtuoso Touch Screen Stylus and Pen for review as well as the other products reviewed yesterday. This is my favorite of all the products I received! It came in really handy during our trip. I have a Motorola Xoom that I got a few weeks ago that I used for accessing the internet in the car on the trip. A Xoom is touch screen tablet. 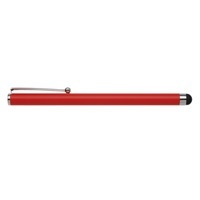 Before receiving this new stylus, I had been using my finger to navigate through the screens. I cannot tell you how much having the stylus made a difference!! It keeps the screen cleaner; the fingerprints from using your finger are annoying! It also makes it so much easier to type. When you use your finger you wind up typing two letters at a time or clicking on the wrong place on the screen. The price is really reasonable too, $24.99 with one that also has an ink pen in the other end and $14.99. The stylus works on all tablets, including iPad! Giveaway: I will be giving away 1 Kensington Virtuoso™ Stylus for Tablet to one of my lucky readers! Disclaimer – Kensington supplied me with this product for review purposes only. I was not compensated for this post and all opinions are that of my own. I became a fan of Houston Parenting Multiples on Facebook. I'm a fan of Insider Deals on Facebook. I followed on GFC: Kayla K! I am a new GFC follower (Beeb)! Thank you for the giveaway! I follow Kensington on Twitter - find me @hardertobreathe ! Click here to see my tweet. I like "Houston Parenting Multiples Examiners" on Facebook. (Anja M. Anjathisandthat). I like "Insider Deals" on Facebook. (Anja M. Anjathisandthat).